Keeping files synchronised in different locations has numerous uses, but it is particularly handy when it comes to backing up files. By synchronising folders, it is possible to define a source folder - such as My Documents - as well as a destination folder - such as My Documents Backup - and the two folders will be synchronised so they always contain the same files. This means that when files are created in My Documents, they can be automatically backed up for you, without the need to remember to do so manually. This is precisely the task that PureSync has been designed to perform. 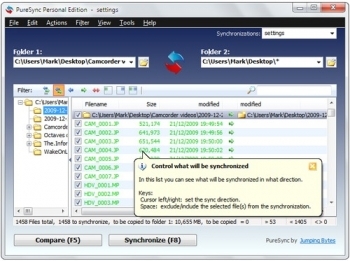 PureSync can be used to perform basic synchronisation jobs like the one described, but it can also be customised to filter out certain types of files, to include or ignore sub-folders and create backup folders based on the date of synchronisation.